There are 3 common species of mesquite: Honey Mesquite (Prosopis glandulosa), Screwbean Mesquite (Prosopis pubescens ) and Velvet Mesquite (Prosopis velutina). 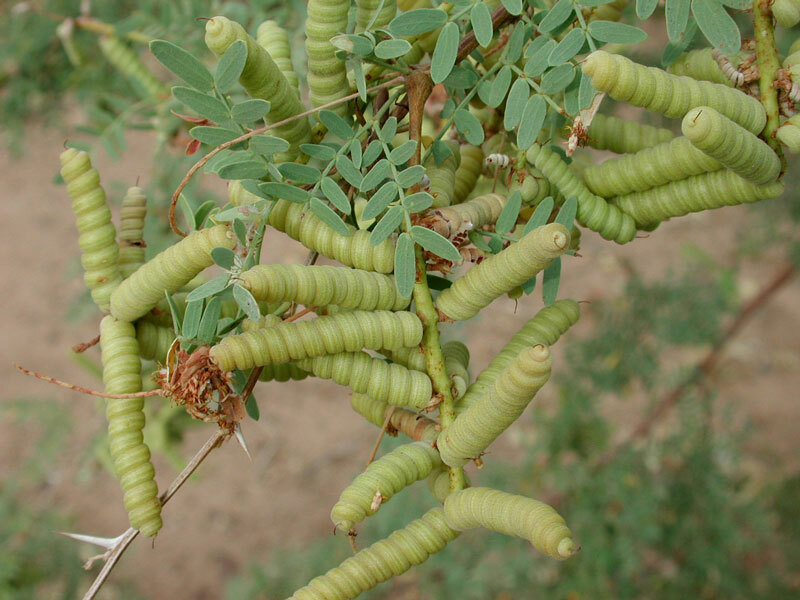 Mesquite pods were good sources of calcium, manganese, iron, and zinc. The seeds within them are about 40 percent protein, almost double the protein content of common legumes. 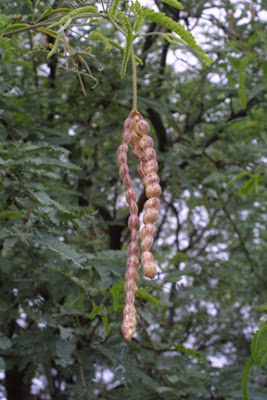 Even during a drought, mesquite is a prolific producer of seed-filled pods. Honey Mesquite has a rounded crown and crooked, drooping branches with feathery foliage and straight, paired spines on twigs. This tree normally reaches 20–30 ft but can grow as tall as 50 ft. It is considered to have a medium growth rate. Honey Mesquite coppices due to latent buds underground, making permanent removal difficult. A single-trunked tree that is cut down will soon be replaced by a multi-trunked version. It flowers from March to November with pale, yellow, elongated spikes and bears straight, yellow seedpods. The seeds are eaten by a variety of animals, such as Scaled Quail. Other animals, including deer, Collared Peccaries, and jackrabbits, feed on both pods and vegetation. Prosopis velutina, commonly known as Velvet mesquite, is a small to medium sized perennial tree. 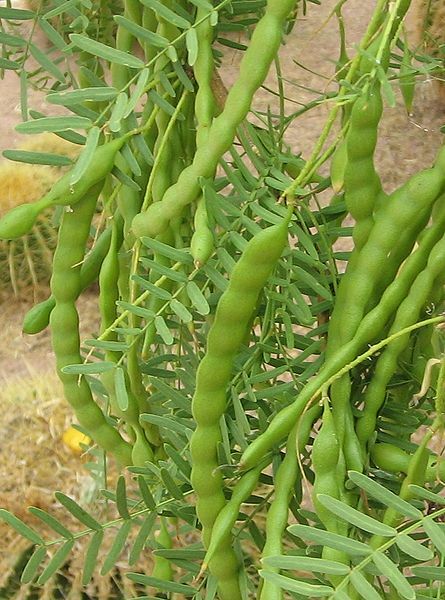 It is a legume adapted to a dry, desert climate. Though considered to be a noxious weed in states outside its natural range, it plays a vital role in the ecology of the Sonoran Desert. Velvet mesquite is native to the Sonoran, Mojave, and Chihuahuan Deserts. It grows at elevations below 4,000 to 5,000 feet in desert grasslands and near washes. The main distribution is in central and southern Arizona and in adjacent Sonora Mexico. Near waterways mesquites can form deciduous woodlands called bosques. Velvet Mesquite can grow to 30–50 ft tall or more. It grows larger in areas with ample water, smaller in open, dry grasslands. The youngest branches may be green and photosynthetic. Young bark is reddish-brown and smooth. As it matures, it becomes a dark, dusty gray or brown and takes on a shredded texture. Yellow thorns up to one inch long appear on the young branches. The leaves are about 3-6 in long, fine, and bipinnately compound. The native range of screwbean mesquite extends from southeastern California west into southern Nevada, extreme southwestern Utah, southern and western Arizona, southwestern and south-central New Mexico, western Texas and northern Mexico, including Baja California, Sonora, Chihuahua, and Coahuila. A healthy stand of mesquite produces as much food value through its pods as does a wheat field under cultivation, and the mesquite does it without capitalization, pesticides, fertilizer or irrigation and with minimal cultivation." Mesquite flour from grinding the whole pods produces fructose, which can be processed without insulin, and soluble fibers, which are slowly absorbed, without a rapid rise in blood sugar. Dr. Nabhan, who has participated in medical studies of mesquite and other desert foods, said that despite its sweetness, mesquite flour (made by grinding whole pods) "is extremely effective in controlling blood sugar levels" in people with diabetes. The sweetness comes from fructose, which the body can process without insulin. In addition, soluble fibers, such as galactomannin gum, in the seeds and pods slow absorption of nutrients, resulting in a flattened blood sugar curve, unlike the peaks that follow consumption of wheat flour, corn meal and other common staples. Mesquite beans are usually harvested after they turn hard and golden. Both the pods and the seeds (which are very tough) are ground into meal. The native people sprinkled the ground meal with a little water to form small, round cakes. Later, slices of dried cake were fried like mush, used to thicken stews, or eaten raw. The meal is also used as flour to make flat bread. Mesquite meal is gluten free. The pods of mesquite beans are very sweet and the sweetness comes from fructose which doesn’t require insulin to be metabolized. The seeds contain about 35% protein, much more than soybeans. Mesquite pods contain about 25% fiber. Some research suggests that mesquite meal, with a low glycemic index of 25, helps regulate blood sugar. Mesquite flour is used to make a refreshing drink. If allowed to ferment, a mixture of water and mesquite flour produces a fizzy alcoholic drink. Mesquite flowers are collected and boiled to make tea. The flowers are also roasted and pressed into balls as another food source. The black tar or sap of mesquite trees can be boiled and diluted with water to make eye wash and an antiseptic for open wounds. It was also used on sore lips, chapped skin, as a sunburn lotion, and as a treatment for venereal disease. A liquid made from boiling the inner bark of the tree was used as a laxative and as an emetic. Tea made from mesquite leaves was used for headaches and stomach trouble. This tea also was used to cure conjunctivitis and to heal painful gums. 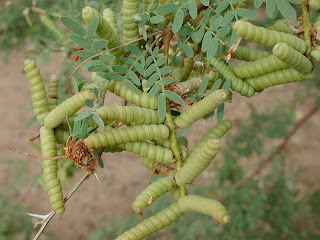 Among the 3 species of mesquites in the desert, Honey Mesquite (Prosopis glandulosa) is most preferred for brewing tea. Place 8 or 9 green or dry yellow twigs in a cup. Fill with boiling water, cover and steep 20 minutes. Or boil 24 seed pods in a pot for one hour. This sweet, mild tea has a vanilla-like flavor. It was used by Native Americans to treat diarrhea and stomach ulcers. The mesquite can be used for- food, medicine, shade, shelter, weapons (bows, arrows, wooden knife, throwing stick, etc. ), tools (handles, digging sticks, improvised sowing needles), trap making, fire, and cooking. This makes the mesquite a very versatile survival plant. To some the mesquite is a pesky weed, to many it is a way to survive. Apply efforts to the preservation of vegetation (including Velvet Mesquite) on our planet with the Online Solar Panels LLC company.